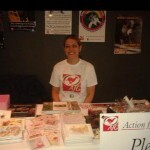 Lynsey and Heather organized this event at the Stadium of Light. This is a great annual event which is growing in popularity each year. 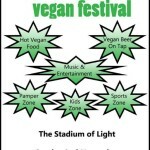 This is the first time the group have done a stall at the Nev Fest which included many local Animal protection campaign/awareness stalls as well as promoting veganism and a cruelty free life style. The girls say they were kept very busy all day and wish the event was held weekly. 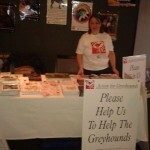 They met some fantastic, compassionate people from the other stalls and received great support all day from the visiting public. The organizers arranged several contests on the day for the various campaigns to benefit from and the competition of who could eat the most sausages (vegan ones of course!! ), all proceeds were donated to Afg. 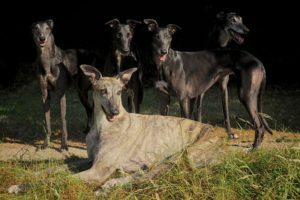 Hopefully this relatively new group who are campaigning in the Newcastle and Sunderland areas, with regular Saturday evening protests outside the Brough Park greyhound track in Newcastle, will gain some new supporters from the awareness at the event. We were made very welcome with 2 of our beautiful greyhounds, with a great space in the store foyer. 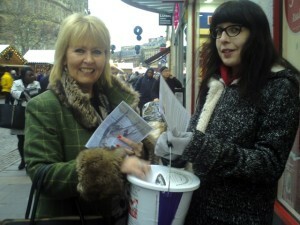 A very busy day with constant support from Tesco shoppers. Several of our 2015 calendars and our packs of unique Christmas cards were sold and we received many very generous donations throughout the day and some people very kindly brought some doggy treats to give the hounds, which of course they received with glee. A busy day today with Rosemary and Penny, lots of new people taking the campaign leaflets as well as the support from regular locals who always make a point of donating to our cause. 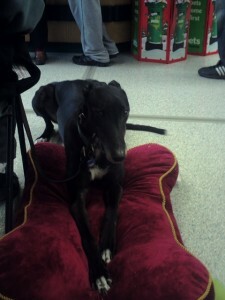 Rosemary and her beautiful greyhound Sean we given a great area inside the store on this very busy weekend. 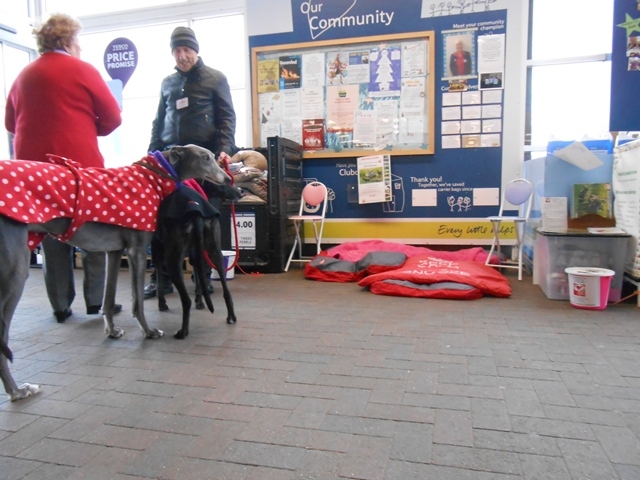 Lots of leaflets given out and many generous donations made and of course lovely Sean recieved lots of attention and he did a great job making people aware that greyhounds are just so gentle and charming. One little girl who was frightened of dogs, gradually plucked up courage to stroke Sean and soon became besotted by him….well done to Sean, a great ambassador for the greyhounds.